The Bell Variant Bike Helmet is a classic helmet offering excellent head protection for bikers. It is designed with an advanced Bell Fusion technology that incorporates a bottom wrapped in-mold micro shell with a fit system for GPS, a VPV visor that is adjustable, nineteen cooling vents for adequate ventilation and levers operated with cam-lock. 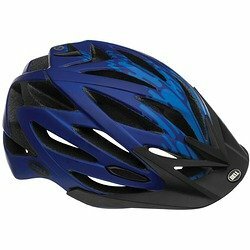 This feature packed bike helmet is an all-weather and durable piece of headgear designed with style to keep your head safe. Designed with the advanced Bell Fusion technology that incorporates a bottom wrapped in-mold micro shell that is reinforced internally for resistance to impact, toughness, and durability. Nineteen large vents with deep channelling on the inside for efficient distribution of cool air from the front, swirling it efficiently over the head and expelling the warmed air via exit ports at the rear for maximum cooling effect. Adjustable Visor which offers fifteen degrees of simple and vertical modification of the visor’s position while on the go and the selected adjustment is locked it and firm irrespective of the vibrations that comes from rough terrain. Ability to select and lock in the perfect fit on the rear by adjusting the horizontal position via a fitting system utilizing a twin axis gears. It comes with levers operated via cam-lock to provide a customized fit for added protection. Available in different colors for added beauty. The Bell Variant Bike Helmet is a very light and durable piece of head gear with lots of protective features for bikers. It features an in-mold technology for protection which is far advanced and better than helmets built with foam material plus it has the advantage of having the ability to adjust the size for a customized, thereby making it more flexible than helmets built for just a particular size. The helmet is well padded on the inside and the pads are cushioned to lock in place providing comfort and they prevent sweat from getting into the eyes. It comes in many beautiful colors, the vents are big and are strategically placed into the airstream to provide enough cooling during sweaty rides. The visor which is removable is useful when biking in sunny conditions as they help shield your eyes form sun glare. The Bell Variant Bike Helmet comes with a very affordable price tag, offers excellent protection to the head and is recommended for every biker.